About 75 percent of Africa’s savannahs and more than two-thirds of the lion population once estimated to live there have disappeared in the last 50 years, according to a study published this week in the journal Biodiversity and Conservation. The study, led by Duke University researchers, estimates the number of lions now living on the savannahs to be as low as 32,000, down from nearly 100,000 in 1960. 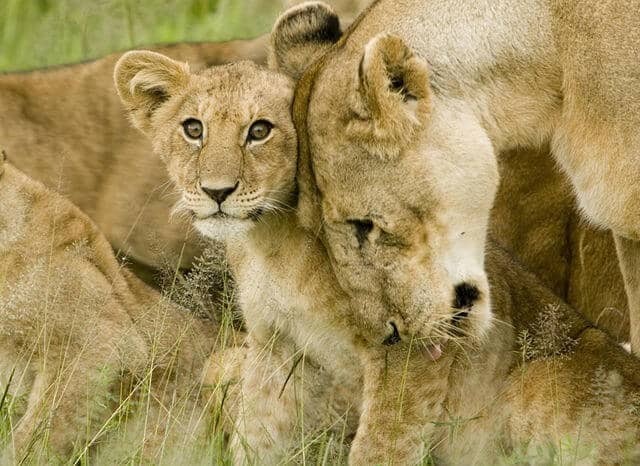 Lion populations in West Africa have experienced the greatest declines. “The word savannah conjures up visions of vast open plains teeming with wildlife. But the reality is that massive land-use change and deforestation, driven by rapid human population growth, has fragmented or degraded much of the original savannah. Only 25 percent remains of an ecosystem that once was a third larger than the continental United States,” said Stuart Pimm, Doris Duke Professor of Conservation Ecology at Duke’s Nicholas School of the Environment. Pimm and his colleagues used high-resolution satellite imagery from Google Earth, coupled with human population density data and estimates of local lion populations, to map areas still favorable to the big cats’ survival. They identified only 67 isolated areas of savannah across the continent with suitably low human impacts and densities. Of these, only 10 spots were deemed to be “strongholds” where lions have an excellent chance of survival. Many of the strongholds are located within national parks. None of the strongholds is located in West Africa, where human populations have doubled in many countries over the last 20 to 30 years. The new study suggests fewer than 500 lions remain in this region, and they are scattered across eight isolated sites. “Giving these lions something of a fighting chance will require substantial increases in effort. The next 10 years are decisive for this region, not just for lions but for biodiversity, since lions are indicators of ecosystem health,” said Andrew Jacobson, a member of Pimm’s lab. “A 75 percent reduction in extent of African savannah is stunning and grim. It emphasizes the urgency for conservation of these great habitats and their magnificent species like lions,” said conservation scientist Thomas E. Lovejoy, University Professor for Environmental Science and Public Policy at George Mason University and Biodiversity Chair of The Heinz Center. Lovejoy serves as grants committee chair of the Big Cats Initiative. To arrive at their new population estimate of between 32,000 and 35,000 lions, the research team organized an international group of experts to systematically evaluate all existing data on lion numbers in Africa, including those by local “user communities” such as hunting organizations. Previous estimates had placed the number of lions remaining on the savannah at between 20,000 and 40,000. African savannahs are defined as areas that receive between approximately 11 to 59 inches of rain annually. The research was funded by National Geographic’s Big Cats Initiative, a long-term effort to halt the decline of big cats in the wild through assessment efforts, on-the-ground conservation projects, education and a global public-awareness campaign.